This paper has been submitted to R. Diederichs for publication in the journal NDT.net (www.ntd.net). The authors hope to publish additional works demonstrating the issues and benefits of photoelastic visualization and modeling conveying the considerations when working with complex part and target geometry. This paper is the first in a series of papers that present comparisons of modeled, scanned and visualized sound fields as they interact with targets and demonstrates how transducer characteristics and geometry influence results. In order to understand sound interaction and to accurately model sound when dealing with complex geometry and various target configurations, as many parameters as possible should be known to generate informative and useful results. The opportunity to model a target followed by the scanning of the component adds to the validation of the exercise. 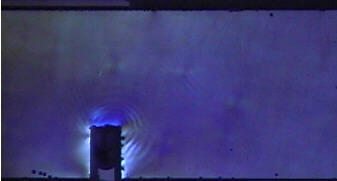 The final stage of this process can be achieved by visualizing the sound in the part as it interacts with the target. In addition to the material properties the target characteristics in the model were considered. For this first demonstration it was agreed to use relatively simple targets. These included a side drilled hole and a square notch. These targets are commonly used as reference targets in ultrasonic testing. Using the Imagine 3D software a model of the test piece was made with all dimensions full scale. The software also allows the selection of probe parameters to match those used in the inspection. Imagine 3D is a Raytracing software package and does not handle wave propagation as provided by Elasto dynamic Finite Integration Technique (EFIT). As a result, diffraction effects are not calculated. Mode components can be viewed and multiple configurations can be made displaying many complex configurations. Figures 1 and 2 illustrate the actual and modeled test piece. The overall dimensions were 154mm long, 25mm deep and 19mm high. The side-drilled hole was 3mm diameter and was made through the 25mm depth. In the same plane 2x6mm and 3x10mm notches were cut. 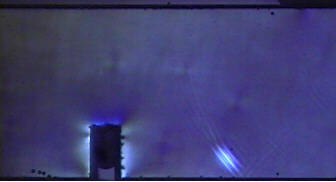 Fig 1: Photograph of Fused Silica Test Piece. 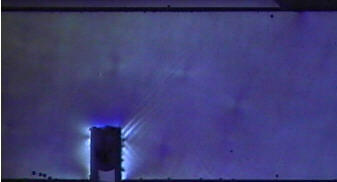 Fig 2: Screen Capture of Modeled Test Piece with Probe. 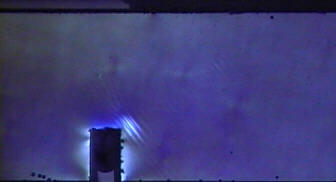 Several scans of the test piece were made. The probe selected was a 7.5MHz 12.7mm diameter piezo element with a 125mm radius of curvature on a nominal 45° refracting wedge for steel. This produced a focal spot at approximately 25mm in the glass. Since the shear velocity of the glass is greater than the steel it was designed for, the refracting wedge produced a refracted angle of 55°. 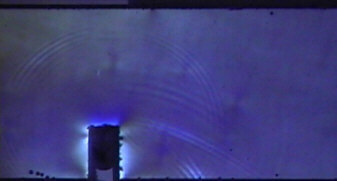 Scanning was performed using a contact technique but with the test piece and probe under water. This provided a uniform coupling condition at all times. 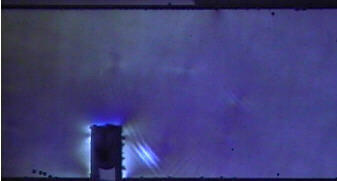 This configuration also allowed a simultaneous visualization as the scanning tank was positioned in the light path of the photoelastic visualization setup. A description of the photoelastic technique has been provided previously  and is summarized. Pulsed light is passed from the light source at a fixed repetition frequency on the order of 100 Hertz. Unpolarised light from the spark gap passes through a polarising filter. This changes the light that passes through the polariser to linear polarised light. 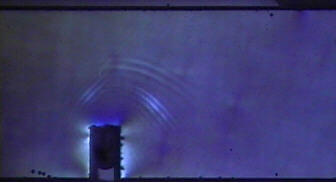 A quarter-wave plate that changes the linear polarised light to circular polarised light follows this. An analyser and optional second quarter wave plate are inserted into the light path and the orientation configured to null the light passing through the analyser. 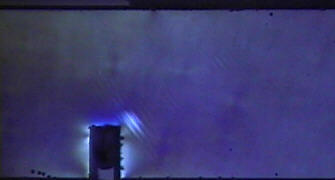 A clear transparent solid such as glass is inserted into the light path between the polariser and analyser. When stresses in the glass are set up by a mechanical disturbance such as our ultrasonic pulse, it causes a change in the rotation of the polarised light. Changes in stress along the light path change the conditions that nulled the light passing through the analyser so a small amount of light can then pass to an observer. By adding a delay circuit we can adjust the position along the sound path that is illuminated by the pulse and the camera allows the observer to record the image. Short scans were made on the side-drilled hole (15mm probe travel) and on the 2x6mm notch (25mm probe travel) cut on the long side of the block. The B-scan images are shown in Figures 3 and 4 displaying the SDH and notch with the probe travel towards the targets. Fig 3: A/B-scan image of 3mm diameter side drilled hole (A-scan displayed at the 7.2mm position). 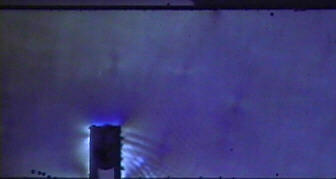 Fig 4: A/B-scan image of 3mm diameter side drilled hole (A-scan displayed at the 7.2mm position). Aligning the photoelastic system to image the probe position, as it existed during the scan, allowed the system to be returned to the encoded position where specific signals were seen on the B scans. At these points a video capture could be taken to analyze where the signals originated. Fig 5: Side Drilled Hole Response Patterns. These conditions are captured as pulse images in Figures 6, 7 and 8. Each figure shows a pulse position slightly before, at and slightly after the midpoint of each situation. Fig 6: Post cursor formation from skip off opposite wall. Fig 7: Corner signal formation. Fig 8: "Pre-cursor" formations off tip. Using the probe positioning feature and viewing the A-scan and text displays in the modeling software, the positions of standoff and time of signal arrival can be predicted. Very close correlations in arrival times are seen between the predicted arrival times conveyed by the modeling and those obtained from the actual measured times viewed in the collected B-scans. Fig 9: Modeled Side Drilled Hole Response Patterns. Fig 10: Example showing comparison of photoelastic and modeled. Fig 11: Modeled Notch Response Patterns - Post Cursor. Fig 12: Modeled Notch Response Patterns - Corner signal formation. Fig 13: Modeled Notch Response Patterns - "Pre-cursor" formation off tip. - Post Cursor, Corner signal formation and Pre-cursor formation off tip. In Figure 14 the images shown demonstrate the varied time of the A-scan signal and display the probe progression along the test piece as it travels towards the notch. By examining the various methods used to image the signals as they interact with the targets in our test piece, we can see the benefits of numerical modeling as applied to procedure and application development. Raytracing software has a place for everyday ultrasonic applications as it provides a simple, fast tool that enables evaluation of ray interaction with user-defined components, targets and transducers. The ability to quickly mock-up the inspection of a component with complex geometry can save operators time and money when used appropriately. Modeling has proven an effective tool to predict signal arrival times and their origins. The potential of the photoelastic visualization was also revealed and should be considered as a valuable tool for procedure development and training. Wave interaction and mode conversion of pulses provides added understanding of the changes caused by target shapes and geometric conditions. Advancements in methods of target and component fabrication applied to fused silica glass enable very complex configurations to be manufactured. For many applications the combination of techniques demonstrated in this paper should be considered to provide a comprehensive investigation of signal and wave interaction.